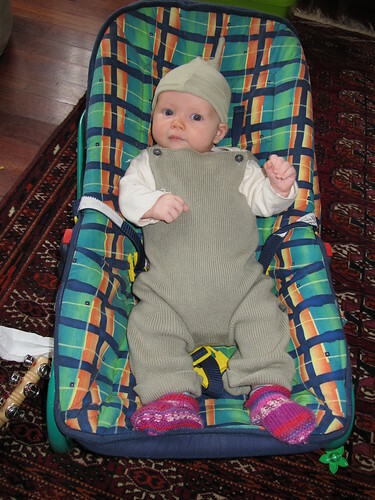 Gumnut baby, a photo by Mistress B on Flickr. Pascal is growing so fast... one minute, he's a little wriggly newborn, the next he's a barrel with legs who's already outgrowing clothes his big sister was wearing not so long ago! He's a better sleeper, and eater, than Nina ever was, although we're still getting nights where the longest stretch of sleep I get is one hour. But even in the wee hours, when I'm cross-eyed with tiredness, he just throws me one of his chubby-cheeked smiles and I melt all over the place. Pascal's gorgeous babyness and Nina's wonderful exuberance are the perfect balance for the third baby occupying my time - my new book project. In contrast to The Sixth Wave, this book is about death - a bit of a change of subject matter. I'm exploring the human experience of death from a range of perspectives, and to do that, I'm interviewing people from all over the world to talk about their personal experiences of death. It's inspiring, challenging, rewarding, exhausting and emotionally intense, but I'm incredibly excited about the project and can't wait to share some of the amazing stories and insights I've come across in my research so far. The book has a publisher (hooray!) so all I have to do is find time in between nappy changes and cuddles to write it. Wish me luck!